TS GO.55 New DA 1.572% to TS Employees from 1st July 2017(Present New DA 25.676%): GO.135 DA 1.572% Sanctioned to TS Employees from 1st January 2017(Present New DA 24.104%): TS #GO.135, Present New DA 25.676%, #DA enhanced from 24.104%(Old DA) of the basic pay to 25.676%(New DA) of basic pay from 1st January 2017, TS GO.135, Dt.22-09-2017, DA enhanced from 24.104%(Old DA) to 25.676%(New DA) , Arrears : 1st January 2017 to 31 August 2017 to GPF, Cash from 25th September, 2017, DA 1.572% enhanced from 24.104%(Old DA) to 25.676%(New DA) from 1st January 2017. 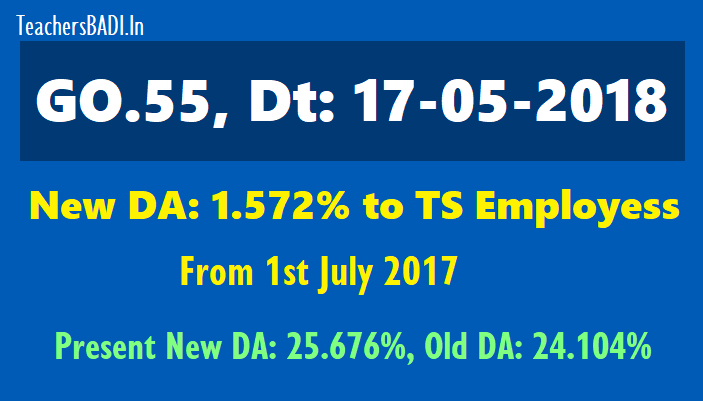 DA enhanced from 24.104% (Old DA) to 25.676% (New DA)- #Present New DA:25.676%: TS Government has sanctioned the Dearness Allowance (DA)(1.572%) to the employees of Government of Telangana State from 24.104% (Old DA) of the basic pay to 25.676% (New DA) of basic pay from 1st July 2017. TS Govt enhanced DA to State Employees and Teachers. DA GO Ms No 55 Fin Dept dated: 17-05-2018 released. 2. Employees who are Governed by CPS 10% of DA from 1st July 2017 to 3oth April 2018 shall be credited in to PRAN A/Cs. And remaining 90% of DA arrears shall be paid in cash. DA GO.55: The Dearness Allowance sanctioned in the paras 1-5 above shall be paid in cash with the salary of May, 2018 payable on 1st of June, 2018. The arrears on account of payment of Dearness Allowance for the period from 1st of July, 2017 to 30th of April, 2018 shall be credited to the General Provident Fund Account of the respective employees.